Rivals of Ixalan is the latest set for Magic: the Gathering, and the second set in Ixalan block. Ixalan is a wild plane, the home of dinosaurs, vampires, merfolk, and the abode of pirates. Double-faced cards make a return in Rivals of Ixalan, with a twist–all double-faced cards flip into lands with a beautiful new card style! 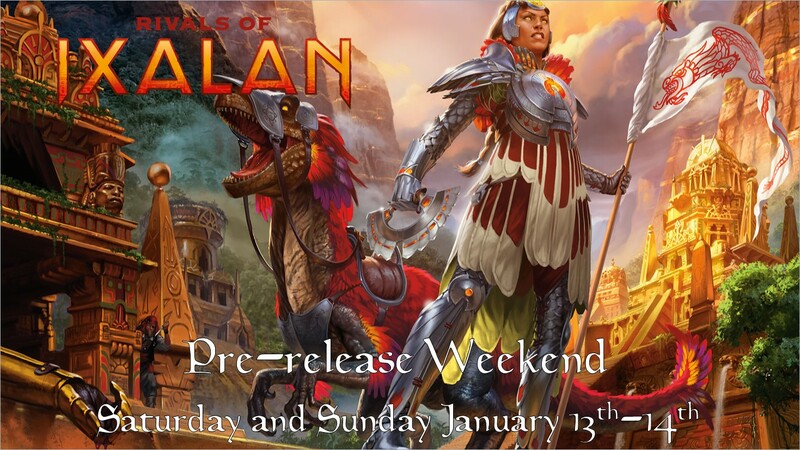 This is a sealed deck event where each player will receive a special kit containing six packs–four Rivals of Ixalan, two Ixalan, a promo card, and a spindown life counter. Continuing in this set, ANY rare or mythic rare can appear as a date-stamped promo card! Each player builds a 40 card minimum deck from the cards in their kit and basic lands (bring your own or use ours). There are four separate events throughout the weekend. Sealed deck at midnight Saturday, Sealed deck at 11 a.m. Saturday, Two-Headed Giant Sealed at 4 p.m. on Saturday, and Sealed deck at 11 a.m. on Sunday. For more information, and a pre-release primer, click here.